Bhilwara, Rajasthan: Badliyas panchayat in Rajasthan’s Bhilwara district has a sarpanch, or headman, filled with contrition. Dashrat Singh not only wrote a cheque of Rs1.3 lakh giving money back to the panchayat, but he also swore an oath in writing that he wouldn’t ever make the mistake of trying to pocket money meant for the government’s rural jobs programme. Singh was caught because of one of the things that makes the programme unique—social audits that allow non-governmental organizations to run checks on the programme. The audits, it would appear, actually seem to work. The first phase of the audit in Bhilwara district that started on 1 October has revealed irregularities and corruption relating to the use of sub-standard materials, the use of machinery instead of manual labour and the non-issuance of job cards, needed to ensure that the right people are being paid. As many as 12 first information reports or FIRs—filed by the police department in crimes, these reports recognize that one has been committed—have been filed in the district against government officials as a result of the audit. Punishment will follow, says the state official in charge of the programme in the state. “There will be FIRs, charge-sheets, suspensions and terminations against corrupt officials, whether at panchayat level, block level or state level," said Rajendra Bhanawat, Rajasthan’s NREGA commissioner. “We can’t really hang them, but we will do what we can to undo what has happened." Panchayats and blocks are administrative units. The results of such audits are put up for public display. Villagers recently queued up for a chance to speak about similar issues at a meeting at Baran village of Banera panchayat. 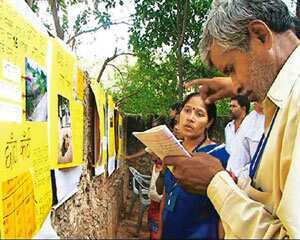 The walls of the local school were covered in posters made by the villagers listing the various irregularities found in the social audit. Ram Niwas Mehta, Rajasthan’s NREGA project director, who likened the Dashrat Singh episode to a Bollywood plot, said the audit was forcing officials to learn the programme’s stringent accountability rules. Mehta showed Mint a letter in which a NREGA programme officer wrote that he had no idea that he had to account for payments made for purchases. He was also not aware that he couldn’t issue non-account payee cheques or that he needed to put dates on all receipts. The idea of an institutionalized social audit has been included as part of legislation for the first time. Social organizations work alongside government officials on the audit, involving grass roots groups and the local people. Audits of government programmes are traditionally conducted by government officials. “When I joined, audits were exercises done behind closed doors, there was no public participation, people didn’t know when it happened and, of course, there were hardly any objections on how the scheme was implemented," said Manju Rajpal, Bhilwara district collector and a former NREGA commissioner. “It was like just sitting and making note of what works were done at how much cost and that’s it." In Bhilwara, teams of social auditors covered the district collecting information about the scheme in the first phase of the exercise, which spanned 11 panchayats out of the 281 in the district. They inquired into complaints as well as the expenditure incurred and the materials used. The two organizations that were involved in the process were the Mazdoor Kisan Shakti Sangathan (MKSS), a farmers’ group, and the Soochna Evam Rozgar Adhikar Abhiyan, a Rajasthan-based federation of civil organizations. The checks will continue until all the panchayats are covered in Bhilwara, which is also the constituency of C.P. Joshi, who as the current Union rural development minister is directly in charge of the programme, giving added impetus to the exercise. The whole exercise involves 2,400 people, including 800 government officials, divided into 135 teams, which will cover the whole district at a cost of Rs30 lakh to the state government. State NREGA commissioner Bhanawat said that, all told, in less than one year there have been around 300 FIRs against sarpanchs, block development officers (BDOs) and state administrative service officials, 40 programme officers’ contracts have been terminated and 30 gram sewaks have been suspended. “We discovered embezzlement of Rs1 crore in Pali district five months back, because of which the BDOs were suspended and the sarpanchs are still in jail," he said. Officials were unable to put a number on the extent of corruption in the district. “The social audit of all the panchayats will give the real picture," Rajpal said. “What we are looking at are the irregularities mainly in asset creation, namely roads etc. and in employment and wages." Compared with the well-known problems of discrepancies in wages and job cards, this audit’s results pointed mainly to procurement and shoddy material, the auditors said. They added that they have also learnt to look for signs of corruption. “Some panchayats only have material sanctioned and some only get labour," Bhanawat said. “Money sanctions only for material are a cause for suspicion and those who sanction more work without completion of previous jobs will be taken to task." The Comptroller and Auditor General of India, or CAG, a sort of super auditor for the government, recently set up a taskforce on social audits under the Act. “Given the constraints, they are doing a commendable job," said Niranjan Pant, CAG director general for local bodies. “Social audits provide public participation, which makes it better and more real. And CAG’s work will be incomplete if it doesn’t have a promotional interest in these processes." Choosing the social auditor would also be critical, he said. Rajpal allowed that there could be a possibility of bias since the social audits were conducted by organizations chosen by the gram panchayats. But the government would like to keep working with the groups they have picked, as they include all the socially active organizations in the state, she said. Rajpal plans to use the report’s findings to focus on the areas that need the most attention. “After this report, I will find the most needy cluster of villages in terms of investigation and follow up and work with the officials," she said. “Why do we have to do it once in a while when it can be done every time?"